One might think that having produced prototypes of the Gengzhi Goblets, our work is just about done to produce sufficient quantity (roughly 300 of each) to serve as G4G13 giveaways. The question comes down to materials and expense. If the Gengzhi Goblets are actually to be used as measuring cups, then they need to be made from a food-safe material. 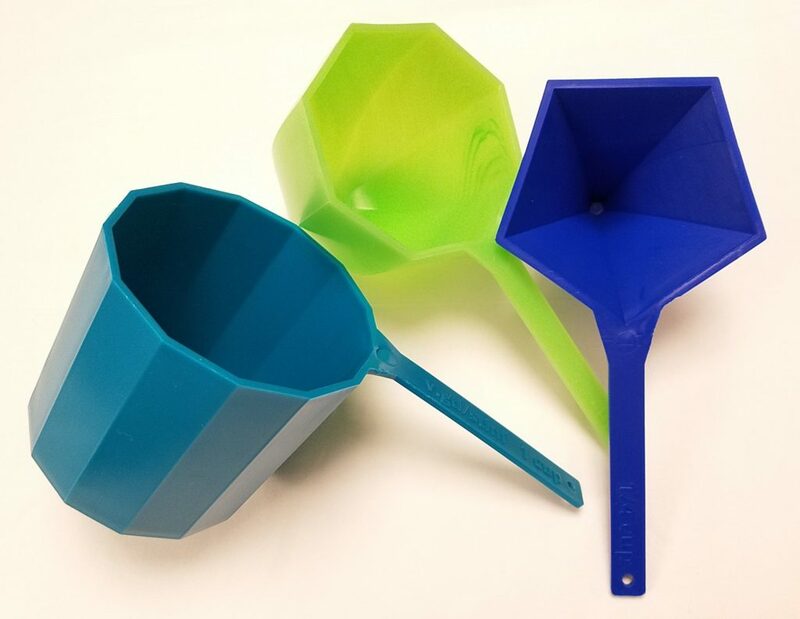 There are not many options in the online 3-D printing world for food-safe materials. Other than bulky, heavy ceramic materials, I found just the Nylon PA12 from Sculpteo, and ordered a set of cups from them. The total came to over $200 for the set, clearly making 3D printing of 300 sets prohibitive. 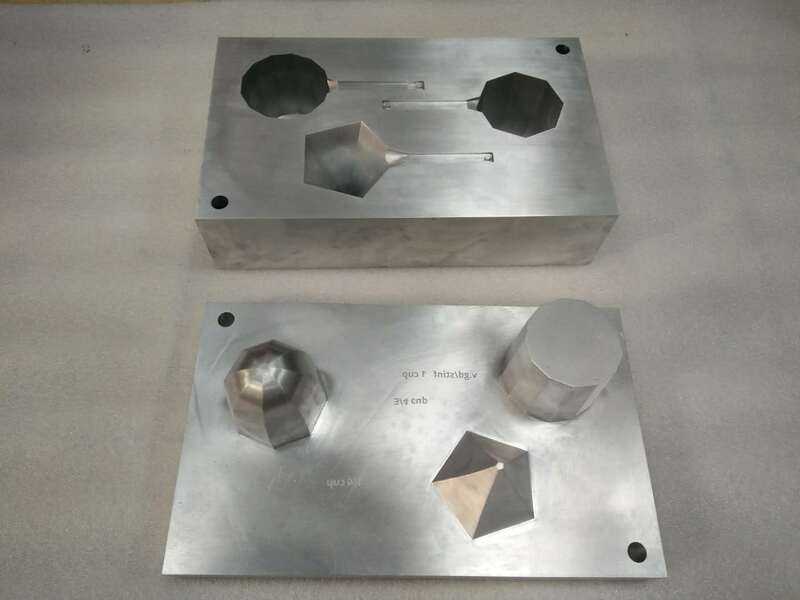 For larger-quantity production, the industry standard appears to be injection molding, and there’s no difficulty in obtaining food-safe plastics from that process. So that’s the avenue I pursued in this case. The most economical supplier I found was Firedrake, although their lead times seem to be a bit longer than some other manufacturers. Ideally, you should be finalizing your designs at least three months before you need the items. However, the next difficulty turned out to be that injection-mold designers don’t want an STL file, typically made up of hundreds or thousands of tiny triangular facets. They prefer STEP files, which consist of many fewer, more structured geometric elements: rectangular solids, cylinders, Bezier curves, and the like. And it’s an entirely different collection of programs for creating and manipulating STEP files. 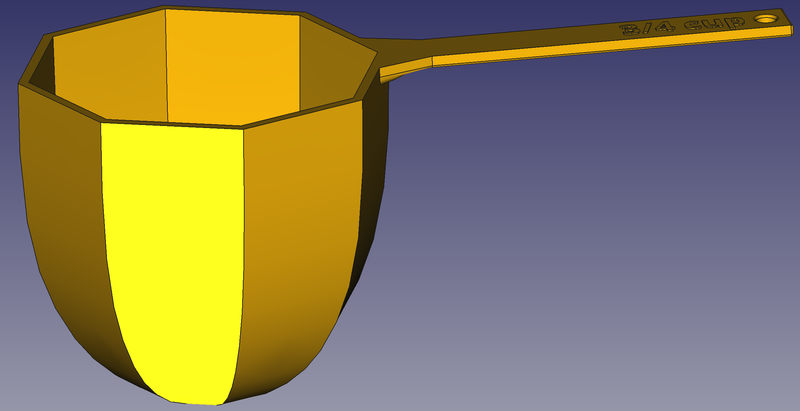 I did some modeling in FreeCAD (free and open-source), but ultimately had difficulty with intersections of two curved surfaces (e.g., in the attachment of the handle to the cup body) in that program, and so completed the cups in OnShape, (online, closed-source, but free for non-commercial use). Note, you can see that in such a design you typically include small bevels at most of the edges, and you also very slightly angle (by a few degrees) all of the “vertical” surfaces so that the piece will unmold more easily. and the completed Gengzhi Goblets have just arrived!